Wi-Fi Protected Access (WPA) and Wi-Fi Protected Access II (WPA2) are two security protocols and security certification programs developed by the Wi-Fi Alliance to secure wireless computer networks. The Alliance defined these in response to serious weaknesses researchers had found in the previous system, Wired Equivalent Privacy (WEP). WPA (sometimes referred to as the draft IEEE 802.11i standard) became available in 2003. The Wi-Fi Alliance intended it as an intermediate measure in anticipation of the availability of the more secure and complex WPA2. WPA2 became available in 2004 and is a common shorthand for the full IEEE 802.11i (or IEEE 802.11i-2004) standard. A flaw in a feature added to Wi-Fi, called Wi-Fi Protected Setup, allows WPA and WPA2 security to be bypassed and effectively broken in many situations. WPA and WPA2 security implemented without using the Wi-Fi Protected Setup feature are unaffected by the security vulnerability. The Wi-Fi Alliance intended WPA as an intermediate measure to take the place of WEP pending the availability of the full IEEE 802.11i standard. 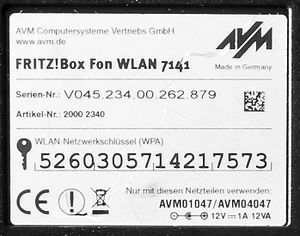 WPA could be implemented through firmware upgrades on wireless network interface cards designed for WEP that began shipping as far back as 1999. However, since the changes required in the wireless access points (APs) were more extensive than those needed on the network cards, most pre-2003 APs could not be upgraded to support WPA. The WPA protocol implements much of the IEEE 802.11i standard. Specifically, the Temporal Key Integrity Protocol (TKIP) was adopted for WPA. WEP used a 64-bit or 128-bit encryption key that must be manually entered on wireless access points and devices and does not change. TKIP employs a per-packet key, meaning that it dynamically generates a new 128-bit key for each packet and thus prevents the types of attacks that compromised WEP. WPA also includes a message integrity check, which is designed to prevent an attacker from altering and resending data packets. This replaces the cyclic redundancy check (CRC) that was used by the WEP standard. CRC's main flaw was that it did not provide a sufficiently strong data integrity guarantee for the packets it handled. Well tested message authentication codes existed to solve these problems, but they required too much computation to be used on old network cards. WPA uses a message integrity check algorithm called Michael to verify the integrity of the packets. Michael is much stronger than a CRC, but not as strong as the algorithm used in WPA2. Researchers have since discovered a flaw in WPA that relied on older weaknesses in WEP and the limitations of Michael to retrieve the keystream from short packets to use for re-injection and spoofing. WPA2 replaced WPA. WPA2, which requires testing and certification by the Wi-Fi Alliance, implements the mandatory elements of IEEE 802.11i. In particular, it includes mandatory support for CCMP, an AES-based encryption mode with strong security. Certification began in September, 2004; from March 13, 2006, WPA2 certification is mandatory for all new devices to bear the Wi-Fi trademark. ↑ "Understanding WEP Weaknesses". Wiley Publishing. Retrieved 2010-01-10. ↑ Viehbock, Stefan (26 December 2011). "Brute forcing Wi-Fi Protected Setup" (PDF). ↑ Meyers, Mike (2004). Managing and Troubleshooting Networks. Network+. McGraw Hill. ISBN 978-0-07-225665-9. ↑ Ciampa, Mark (2006). CWNA Guide to Wireless LANS. Networking. Thomson. ↑ "Battered, but not broken: understanding the WPA crack". Ars Technica. 2008-11-06. ↑ Jonsson, Jakob. "On the Security of CTR + CBC-MAC" (PDF). NIST. Retrieved 2010-05-15. ↑ "WPA2 Security Now Mandatory for Wi-Fi CERTIFIED Products". Wi-Fi Alliance. Retrieved 2013-02-28. This page uses content from Wikipedia. The original article was at Wi-Fi Protected Access. The list of authors can be seen in the page history. As with MattWiki, the text of Wikipedia is available under the Creative Commons Attribution-ShareAlike 3.0 Unported License.